In the Western Sudan, the groundnut is one of the most important cash crops and food staple nowadays. Unlike the African bambara groundnut, it is not an indigenous species, but was brought by Portuguese traders from the Americas in the 16th century. It quickly spread through the Sudan due to its high nutrition values, draught resistance and later, as a product of long distance trade for its oils. Now it is one of the main agricultural products of landscapes that far apart as The Gambia and Northern Cameroon. Fyhri (1998), The Gambia: The complexity of modernising the agricultural Sector in Africa, thesis in geography, University of Oslo. The groundnuts or peanuts are originally South American, were they were grown by Indian communities. It was introduced to West-Africa (first the Senegambia area) by the Portuguese in the 16th century. Here it spread quickly, though faster in the interior of Africa than along the coast. Cultivation on a larger scale began before 1830 in Senegambia, mostly as insurance against failure of the millet harvest, because of it's resistance to drought. The first small exports from Senegambia to Europe were reported from the year 1830. There fallowed a boom in exports when the potentials for peanut oil was realized. I industrializing Europe there now was an ever-growing demand for lubricating oils. Further, oils were needed in the production of soap, as there at the same time was massive campaigning for new standards of hygiene. And of course, vegetable oils were needed for cooking. Groundnut oil, imported from far away coasts, were to become cheaper compared to the traditional vegetable oils used in Europe (olive, flax, sunflower, etc.). Oversea trade was introduced by the British, but soon taken up by Americans, French and others. There was, however, an immediate response amongst the African growers and traders. Relying on existing infrastructure, local traders (Wolof and others), soon were to build up of a system of middle men and an advanced transport system. Production and trade thus expanded rapidly. Americans, using the peanut for direct human consumption, were the main importers in the first decade of oversea trade. 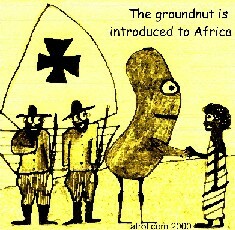 The Americans, however, had a domestic groundnut production, which they were eager to protect. After 1842, therefore, responding to a protective US import tax on peanuts, US imports dropped markedly until the civil war cut off producers in the south. Large scale shipments to France began in the 1840s. Also this was at first halted by a protective tax (to protect the olive oil industry), but the tax was abolished in 1840. French tax policy became trend setting for the peanut export of the whole region. Taxes were heavily reduced (1840) on unpeeled nuts imported on French vessels. This prevented the establishment of an oil processing industry in Africa and made the French the main trading partner in the region (thereby "preparing" their political dominance, as France already had serious interests in the region). New French import taxes on other oil-plants (flax, sesame and poppy seeds) further boosted the import of peanuts from the Guinea region. While the French adopted peanut oil for increasing industrial processes (and for cooking purposes), the British adopted palm oil as the most important industrial oil. As these agricultural products grow respectively in the dry savanna and the moist savanna/rain forest regions, French and British possessions and settlements in these different regions turned in to more hardened patterns. From The Gambia, peanut export production spread rapidly to the coastal and riverine areas of Senegal, Guinea Bissau, Guinea and northern Sierra Leone. Most important for this rapid spread were the African and Eurafrican traders (especially those with French connections), introducing peanuts and promoting trade. The spread to southern Sierra Leone and Liberia went slower as the climatic conditions were less favorable. Here, further, production of palm oil was of greater importance. In The Gambia, the demand for peanut production soon produced a system of migrant workers ("strange farmers") form the interior. Strange farmers are documented to have come to The Gambia as soon as in 1848. These laborers stayed to-three years near The Gambia, working on plantations, then returning home with the goods they had wanted to purchase. The system of strange farmers became a characteristically feature of Gambian peanut production, and soon spread to Senegal. In the southern regions, the increased demand for labor stimulated the regional slave trade to the coast. In the Gambia, on the other hand, the introduction of cheaper strange farmers contributed to abolish slavery. The Dakar Peninsula (around Rufisque) became a marketing and trade center in the region, especially for groundnut products. The French in Senegal actively promoted the spread of peanut production and colonial expansion. From the 1860s, the African and Eurafrican traders along the Guinea coast were reduced to agents of the French Marseille and Bordeaux trading firms. Their branches all along the coast managed to control the entire commerce of the region (including The Gambia). Thus, the French managed to outmaneuver the British on the coast because of their Senegalese pioneer traders, tax policy, support and intervention by the French navy. The commercial hegemony established in the 1860s could be turned into a political hegemony. In that way, the introduction of the groundnut and its overseas trade contributed decisively to how the European were to partition Western Africa. In The Gambia, the groundnut continued to play a lead role in its economic history up till today. This not so much for its nutritional value, but for its export value. This also is the case in most Sahel countries, from Senegambia in the west to Chad in the east. Brooks (1975), Peanuts and Colonialism: Consequences of the commercialisation of peanuts in West Africa, 1830-1870, in "Journal of African History, vol. 16, no. 1, pp. 29-54. Carney (1986), The social history of Gambian rice production: an analysis of food security strategies, PhD thesis, Michigan State University, Ann Arbour. Fyhri (1998), The Gambia: The complexity of modernising the agricultural Sector in Africa, thesis in geography, University of Oslo. Available in our library! Weil (1984), Slavery, groundnuts, and European capitalism in the Wuli kingdom of Senegambia, 1820-1930, in "Research in Economic Anthropology," vol. 6, pp. 77-119. © afrol.com. Texts and graphics may be reproduced freely, under the condition that their origin is clearly referred to, see Conditions.